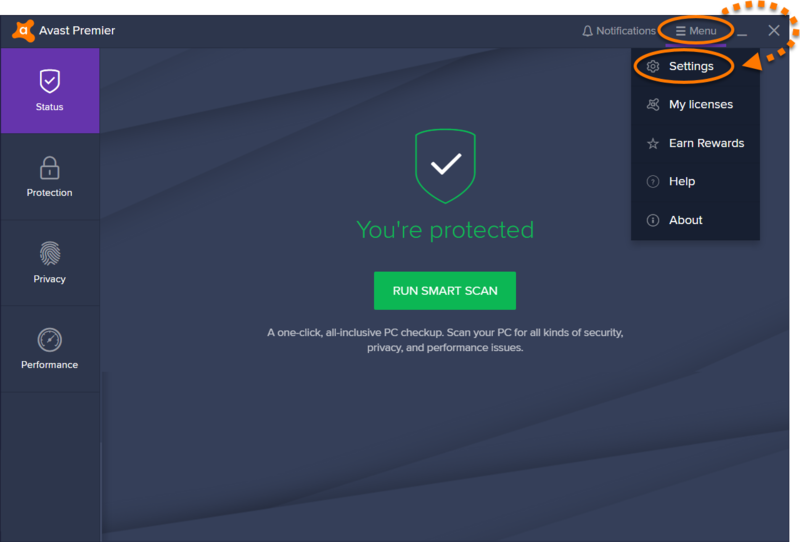 If you use an email client (such as Outlook or Mozilla Thunderbird), Avast may include a clean message (previously an email signature) at the bottom of your outgoing emails to let your recipients know that the email has been scanned for malware. This setting is enabled by default. Open the Avast user interface, and click ☰ Menu ▸ Settings. Select Protection from the left menu, then click Core Shields. Scroll to Configure shield settings and click the tab for Mail Shield. Untick the box next to Add a signature to the end of sent emails. Your outgoing emails will no longer include a signature from Avast. You can re-enable this setting at any time. 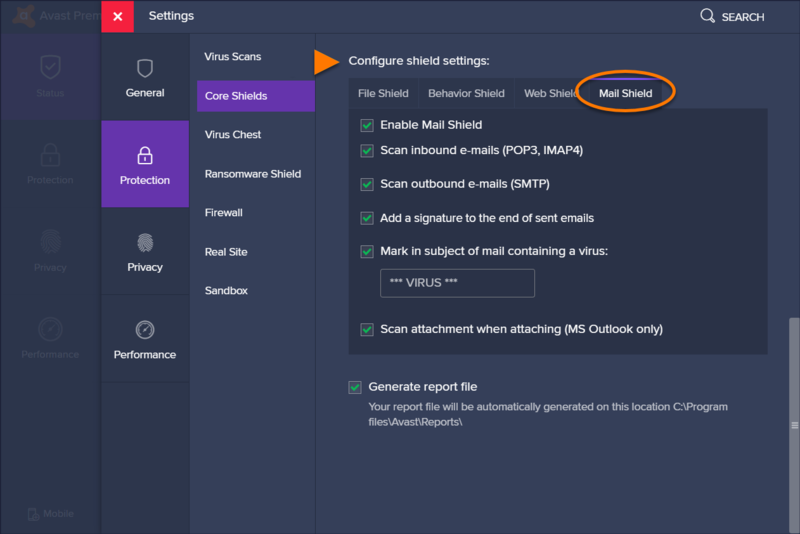 Mail Shield scans for threats in your incoming and outgoing email messages. Scanning applies only to messages sent or received using mail management software, such as Microsoft Outlook or Mozilla Thunderbird. Enable Mail Shield: turn Mail Shield on or off. Scan inbound emails (POP3, IMAP4): specify if Mail Shield should scan all incoming emails sent using an SSL/TLS encrypted connection. 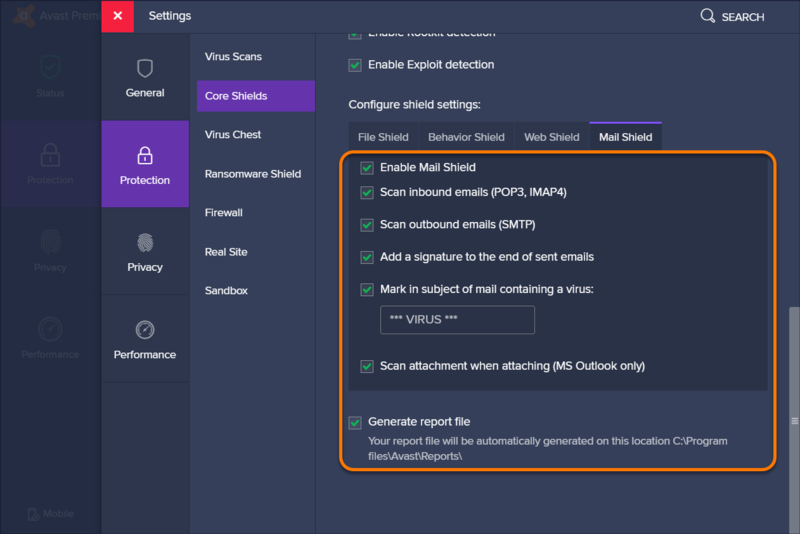 Scan outbound emails (SMTP): specify if Mail Shield should scan all outbound emails sent using an SSL/TLS encrypted connection. Add a signature to the end of sent emails: includes a message for the recipient in an outgoing email confirming the email has been scanned for malware and is clean. Mark in subject of mail containing a virus: specify a specific word or phrase that will automatically be added to the subject of any email containing a virus. Scan attachment when attaching (Microsoft Outlook only): enable Mail Shield to scan outgoing email attachments sent with Microsoft Outlook. Generate report file: specify if you want File System Shield to produce reports of scan results.